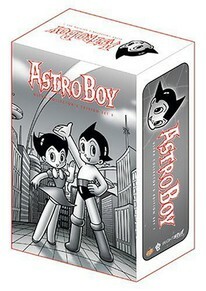 This ultimate Astro Boy collection contains DVD Set 1 (episodes 1-52), plus a special collector's booklet, and an entire DVD full of extra bonus material, including part 1 of an interview with series producer Fred Ladd! The very first anime ever produced, Osamu Tezuka's (Kimba, the White Lion/Phoenix/Metropolis) original 1963-1964 Astro Boy delighted children around the world with its touching stories and compelling characters. In the U.S., many will remember this popular children's series which aired on TV during the 1960s. Now, this groundbreaking series returns for the first time ever in a stunning new collector's edition that includes the first 52 episodes of the original black and white series as seen in the US, restored to pristine detail, and featuring never-before-seen footage and brand new exciting extras. The original boy-robot with 100,000 horsepower strength and courage! In the year 2000, Dr. Boyton creates a super-robot in his deceased son's image. He calls the robot Astro Boy. Astro Boy can swim oceans, leap over mountains, even fly into space on his own power. However, Astro Boy can't replace his son. Dr. Boyton becomes dissatisfied with the boy robot and disowns him. DVD Features: Part 1 of an interview with series producer Fred Ladd; Original Japanese Episode 1 (with English subtitles); Original Character Art Gallery; Merchandise Gallery; A Collector's Booklet featuring "The History of Astro Boy"; an Osamu Tezuka biography.